Villa Lloberina in Pollença is a villa with 1 room. 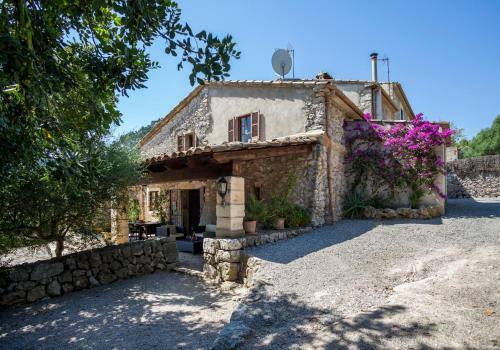 For those clients who are looking for holiday accommodation that is a little different then why not choose C'an Lloberina. 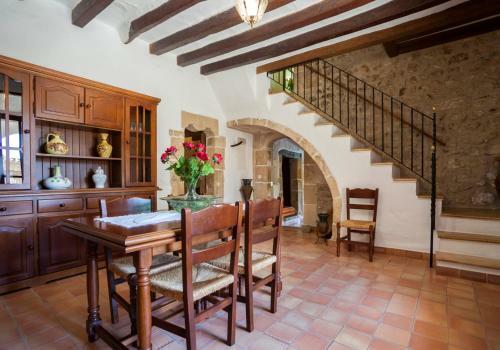 Set in an elevated position overlooking the Colonya valley affording the most glorious views and forming the front part of an old manor house of over 200 years old. Beautifully restored with great care and love by it's owners but offers every modern amenity whilst still maintaining its original character. 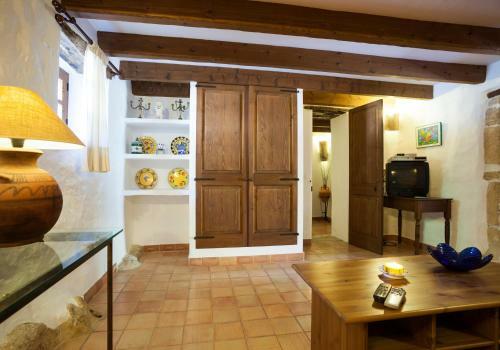 If it is peace and privacy that you are looking for on holiday, then l...ook no further that this gracious house. 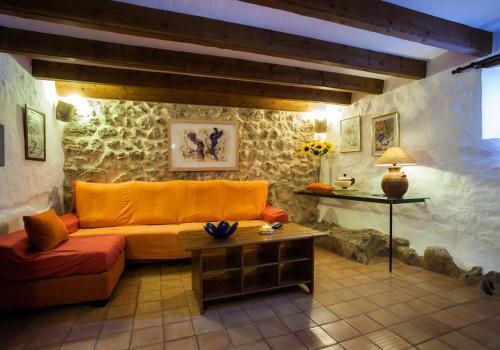 Inside, the beams and stone walls create a warm and cosy atmosphere. The entrance hall/dining room with its high ceiling still has many of the original features. The snug lounge is comfortably furnished and comes complete with satellite TV (limited channels). A spacious farmhouse style kitchen has access to the pool terraces and has dishwasher, microwave, large fridge/freezer and feature fireplace. There is a washing machine in a separate laundry for your added convenience. Finally on this ground floor level is a lovely family bathroom for daytime use. Stairs lead up from the hall to the first floor and four pretty air conditioned/heated bedrooms each with a bathroom en-suite. These consist of two double and two twin rooms all attractively decorated in the local fabric of the area. Two of the bathrooms have small baths with shower above and two are full size baths with shower attachments. All bedrooms are air-conditioned/heating for your added benefit. Outside this property really comes into its own! Surrounding the house the grounds are simply delightful and full of old olive, orange and lemon trees and here the owners have built a small children's play area with swing. To the rear of the house is a covered pergola with outside dining for 8 and this overlooks the 8x8 metre swimming pool, which has been cut out of solid rock. The owner has cleverly made this pool in such a way that its tiles gently slope almost like a beach into the deeper part of the pool and children just love to play and splash about in this area. There are spacious, well furnished sun terraces and a brick built barbecue for those meals al fresco. 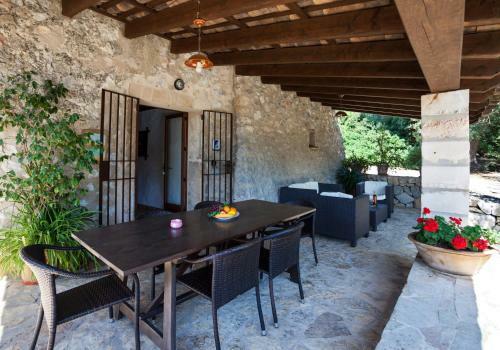 For those clients who are looking for holiday accommodation that is a little different then why not choose C'an Lloberina. 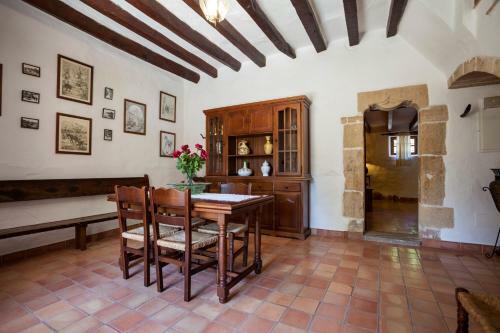 Set in an elevated position... overlooking the Colonya valley affording the most glorious views and forming the front part of an old manor house of over 200 years old. Beautifully restored with great care and love by it's owners but offers every modern amenity whilst still maintaining its original character. If it is peace and privacy that you are looking for on holiday, then look no further that this gracious house. 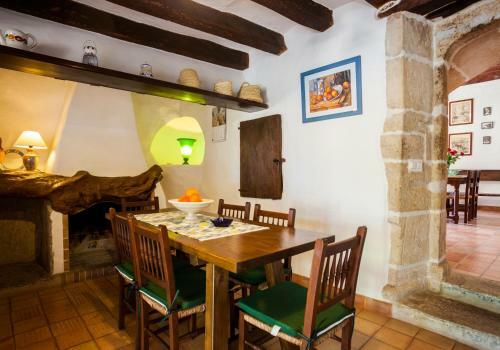 Inside, the beams and stone walls create a warm and cosy atmosphere. The entrance hall/dining room with its high ceiling still has many of the original features. The snug lounge is comfortably furnished and comes complete with satellite TV (limited channels). A spacious farmhouse style kitchen has access to the pool terraces and has dishwasher, microwave, large fridge/freezer and feature fireplace. There is a washing machine in a separate laundry for your added convenience. Finally on this ground floor level is a lovely family bathroom for daytime use. Stairs lead up from the hall to the first floor and four pretty air conditioned/heated bedrooms each with a bathroom en-suite. These consist of two double and two twin rooms all attractively decorated in the local fabric of the area. Two of the bathrooms have small baths with shower above and two are full size baths with shower attachments. All bedrooms are air-conditioned/heating for your added benefit. Outside this property really comes into its own! Surrounding the house the grounds are simply delightful and full of old olive, orange and lemon trees and here the owners have built a small children's play area with swing. To the rear of the house is a covered pergola with outside dining for 8 and this overlooks the 8x8 metre swimming pool, which has been cut out of solid rock. The owner has cleverly made this pool in such a way that its tiles gently slope almost like a beach into the deeper part of the pool and children just love to play and splash about in this area. There are spacious, well furnished sun terraces and a brick built barbecue for those meals al fresco. When would you like to stay at Villa Lloberina? Please inform Villa Lloberina in advance of your expected arrival time. You can use the Special Requests box when booking, or contact the property directly with the contact details provided in your confirmation. This property will not accommodate hen, stag or similar parties.